This beautiful Victorian-style fountain was created and installed in the garden at Government House in 1990. 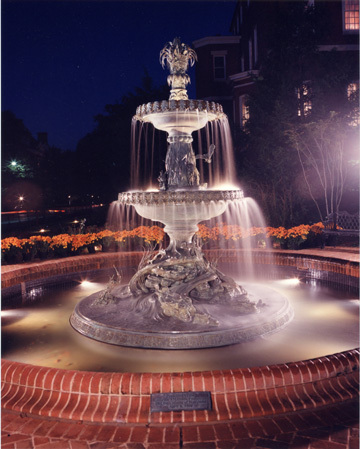 The fountain was designed by Graham Landscape Architects in Annapolis and sculptor Lyle Beddes of Historical Arts and Casting helped to create it. The design includes many images that represent Maryland and its bounty, including corn, crabs, tobacco, terrapins and the Baltimore Oriole, the state bird. 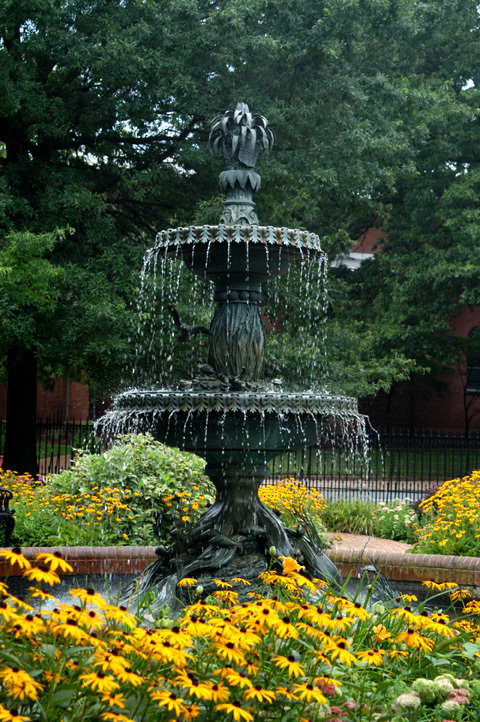 The fountain was the inspiration of former governor William Donald Schaefer and his official hostess Hilda Mae Snoops. It cost $169,000 and was paid for with private funds. In 1994, Governor Schaefer officially dedicated the fountain to Mrs. Snoops, who died in 1999. Government House, which stands across the street from the historic Maryland State House in Annapolis, was built in 1868 as a high Victorian mansion. In 1935, it was expanded and completely renovated into the style of a five-part Georgian house. The fountain stands near a bay window that still remains from the building's Victorian beginnings.